Hello, I live in Santa Rosa, and I am wondering if there is a legit instructor or school for lessons in the Northbay. 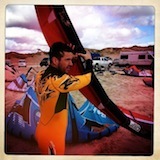 I think Live2kite is my only option closeby...I wonder if there is anyone who gives beginner lessons in Bodega Bay??? I have 2 North 9m-12m kites and 2 boards ready to go! I have been beach kiting with my mountain board and 4m Ocean Rodeo kite, but I want to go play in the water! LOL I am wondering if there may be a group that gets together to go to Bodega or other Northbay kiting spots? Any info would be greatly appreciated! Sadly, you'll now have to wait until next season. It is the end if the season here and anything you would learn from a school at this time of the year would probably be lost by April next year.